Specifications::: Model: K5 Premium, Part Number: 1.603-361.0, Performance Ratings: 2000 PSI 1.4 GPM, Motor: Water Cooled Induction, Pump: Karcher N-Cor, Water Inlet: N-Cor Quick Connect, Water Outlet: N-Cor Quick Connect, Trigger Gun: Quick Connect, High Pressure hose: 25ft. Thermoplastic, Included Spray Wands: Vario Power Spray Wand - Dirtblaster Spray Wand, Features: Trigger Gun Holder - Spray Wand Holder - Onboard Detergent Tank – Hose Reel, Wheel Size: 195mm, Electric Cord: 35ft. 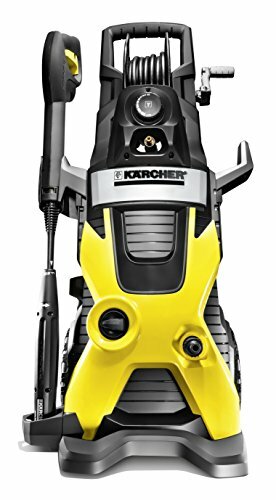 with GFCI, Warranty: Two Year Limited Karcher Warranty, Product Weight: 32 pounds, Product Dimensions: 13.07 inches x 16.77 inches x 34.33 inches.